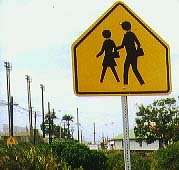 The left sign (straight from New-York) announces the right one, just visible in the background. 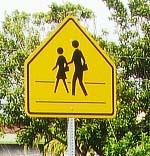 The latter shows the same anomaly as the sign in Guatemala and Belize: the space between the legs is not transparent. People crossing between the lines seems a difficult point for all road-sign artists. They avoid it by drawing a single line at the bottom (e.g. Italy or Madagaskar) or dropping the lines altogether (most countries). Look up their counterparts in the United States.